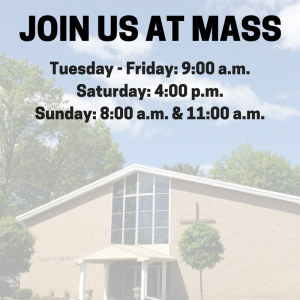 The Prayer Network is a group of approximately 65+ parishioners who pray for a specific intention that has been called in to one of the three coordinators or to the office. The coordinator calls the request to the other two coordinators. Each coordinator has several people they contact who then call others. It operates like a telephone tree. How you pray or what prayers you say is strictly up to you. It is very comforting to know that so many are praying for your intention. Many of the recipients of the prayers say how strongly they feel the prayers. or submitted online here to be prayed for by our vine of 65+ caring people. Please contact one of the women listed above.